Pianist Alla Turbanova, from left, violinist Sandra Smith, cellist Simon Fryer and clarinetist Colin Mehmel perform during the Retro and Jazz concert at the 10th annual Clear Lake Chamber Music Festival in Erickson on Saturday afternoon. The concert also featured Brandon University president Gervan Fearon on saxophone. ERICKSON —The Clear Lake Chamber Music Festival celebrated its 10th anniversary over the weekend with a program featuring some of the best classically trained musicians from Westman and around the world. 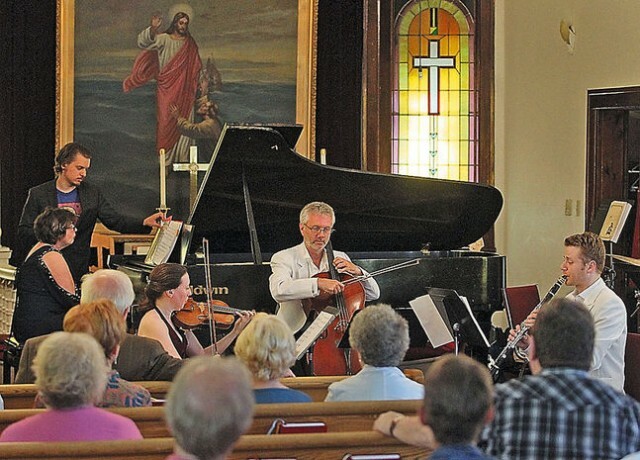 The five-day festival was founded by pianist and Brandon University Prof. Alexander Tselyakov in 2006, with the goal of engaging the local community in high-quality chamber music. Turbanova says the festival has gained a dedicated following over the past decade and she often recognizes most of the audience during concerts. In recent years, the festival has added more contemporary music to its classical foundation, which can be a challenge when it comes to making the program. “This year, we decided to have Beatles music and everybody knows the songs, but to find an arrangement for a chamber group was quite challenging,”said Turbanova. It can sometimes take several years to create a program that offers the right amount of musical contrast. BU president Gervan Fearon is a fan of the festival. “It’s an opportunity to really showcase the best of music being done at Brandon University and across the whole region,” Fearon said. For Fearon, a highlight of the festival was playing his tenor saxophone during the Retro and Jazz concert with the BU Jazz Band, made up of Shannon Chapman, Greg Gatien, Eric Platz, Scott Brown and Jordan Canko. The majority of the concerts took place in an unassuming Lutheran church in Erickson. The small venue has been the festival’s home for two years. “You can see the sweat on the musician’s forehead when he’s doing that riff, and that’s kind of nice,” said festival host Paul Shore. Chamber music, by definition, is an intimate experience because it is typically a selection of impressive classical ballads played on a small number of instruments. Shore says the festival’s longevity is a testament to the impact it has made on the community.